For just research and exploration on your own Windows machine, you’ll probably want to opt for just a single instance database. RAC takes a bit more setup and complexity. 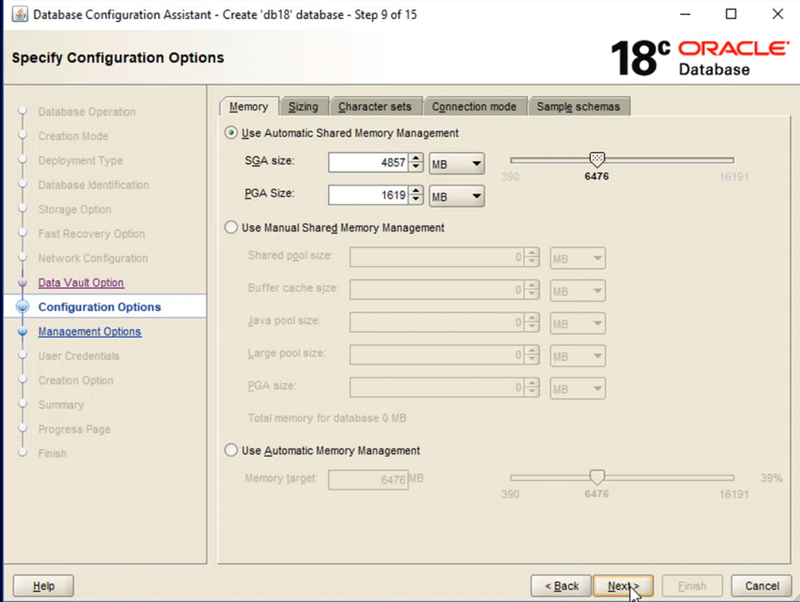 For a faster install, choose one of the options that has the datafiles included. 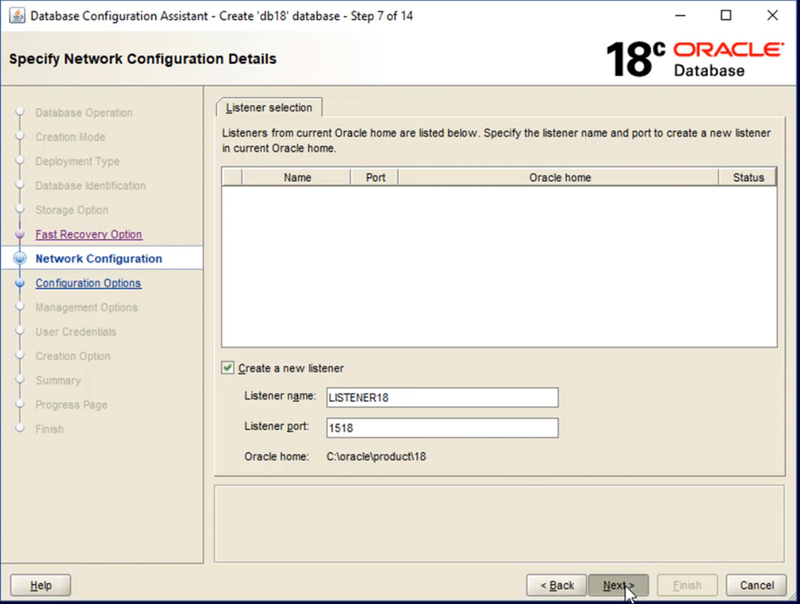 This way, the installer will just copy some existing files and seed them as your database, rather then building the entire instance from scratch. 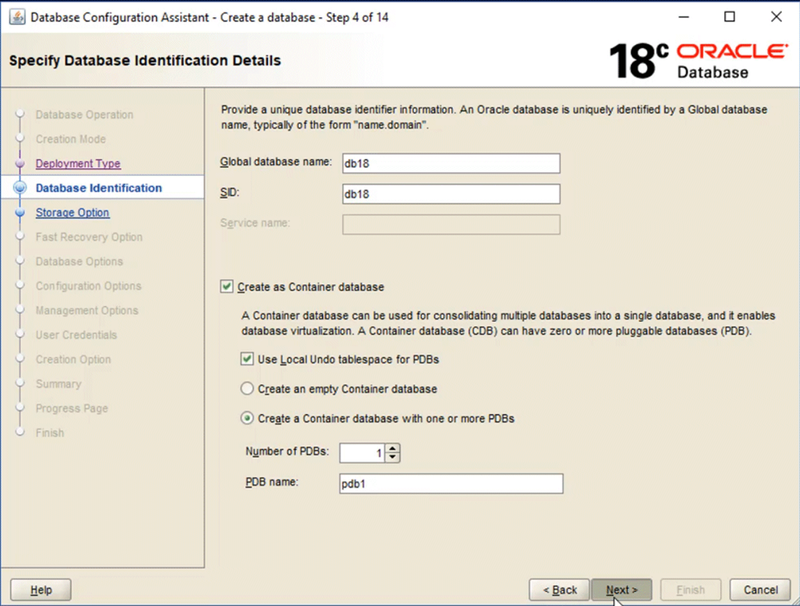 Now choose a unique and memorable name for your database. 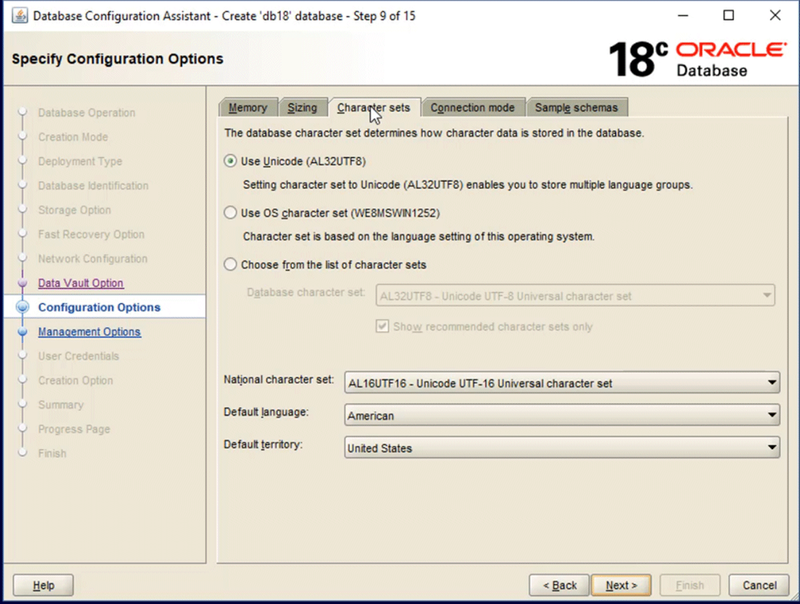 I’ve reached into the depths of my imagination and come up with “db18” for my version 18 database. Go figure . 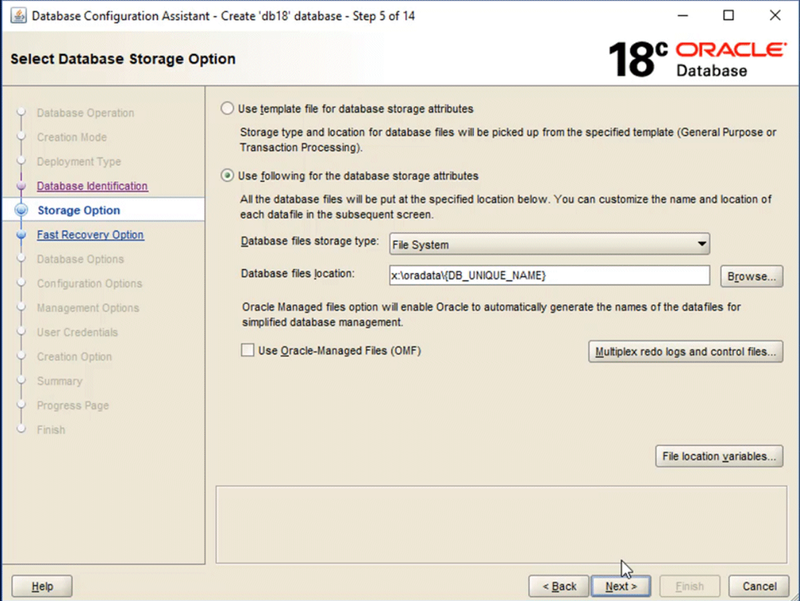 I’d also recommend you go with a container database configuration, because that is the strategic direction for Oracle going forward, so if you are going to have a database to skill up on, it makes sense for that database to be a container database. To keep things simple, I’m just nominating 1 single location for all of my database files. 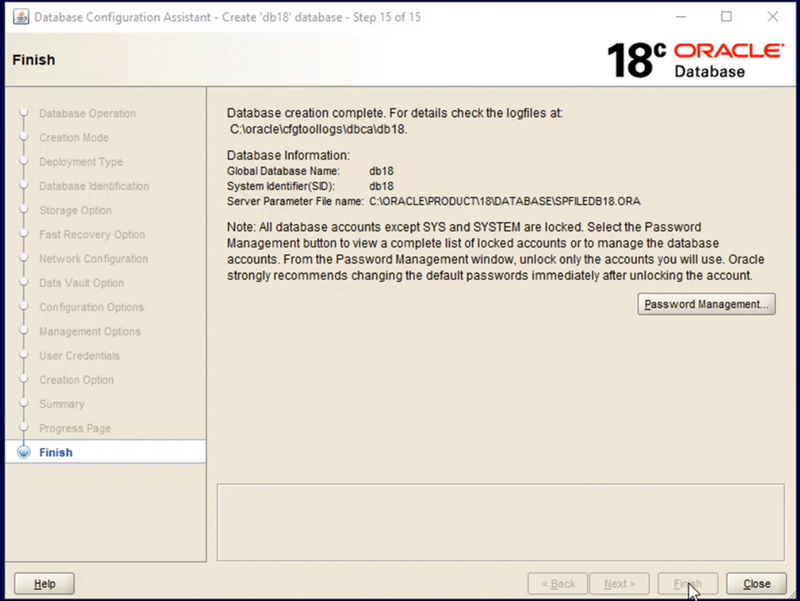 It can be anywhere but a common convention is that wherever you house them, you’ll have a folder called “oradata” and then a folder for each database you create under that. I’m skipping the fast recovery area and archiving at this stage. If I start to get serious with testing things like backup and recovery, then I would revisit this after database creation to enable at least archiving so that I can explore all the goodies that RMAN has to offer. On a brand new installation, it is likely you will not have a pre-existing listener to choose from. (If you had a previous installation, or had run the Network Configuration Assistant already, then you would see a listener to use). I’m creating one called LISTENER18. 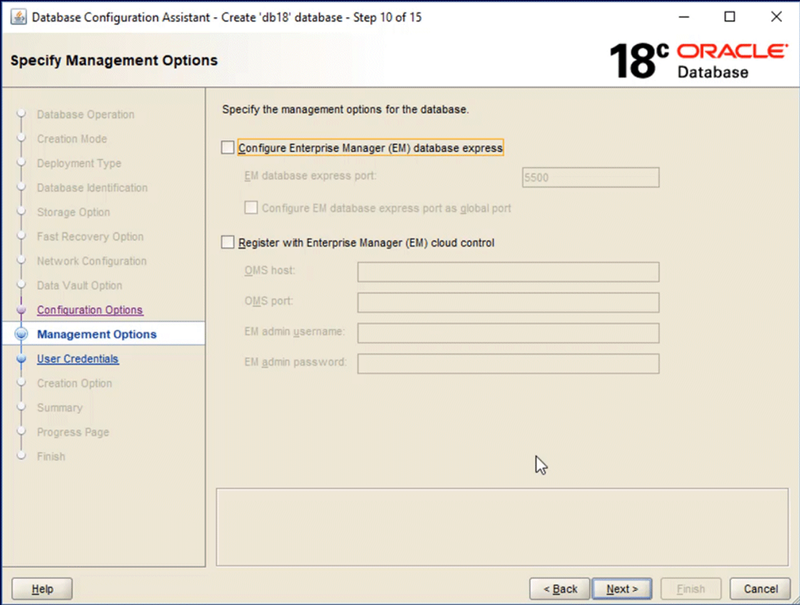 The default port is normally 1521, but I’ve opted for 1518 just to align it with the version I’m using. 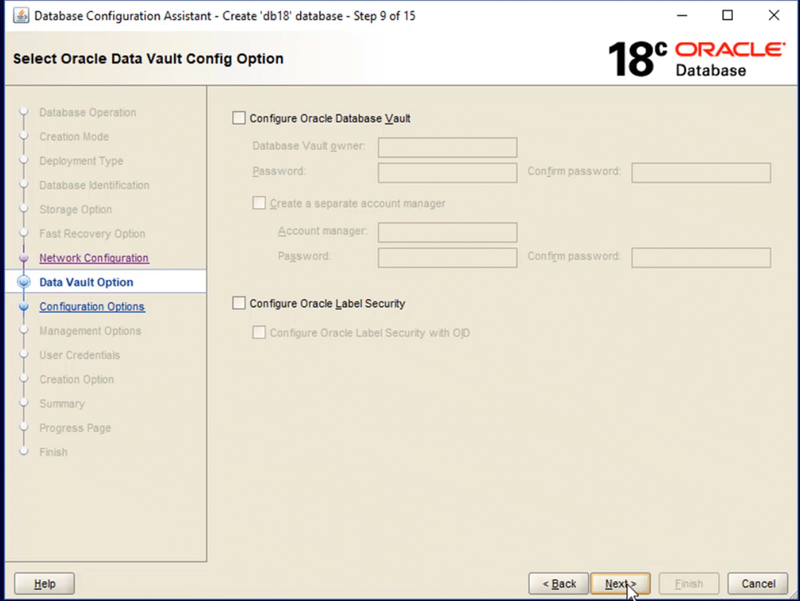 I’m skipping Data Vault and Label Security, but hopefully you can now see why it’s cool to go with the “Advanced Configuration” – you get to see all the potential functionality areas of the database that you might want to explore. 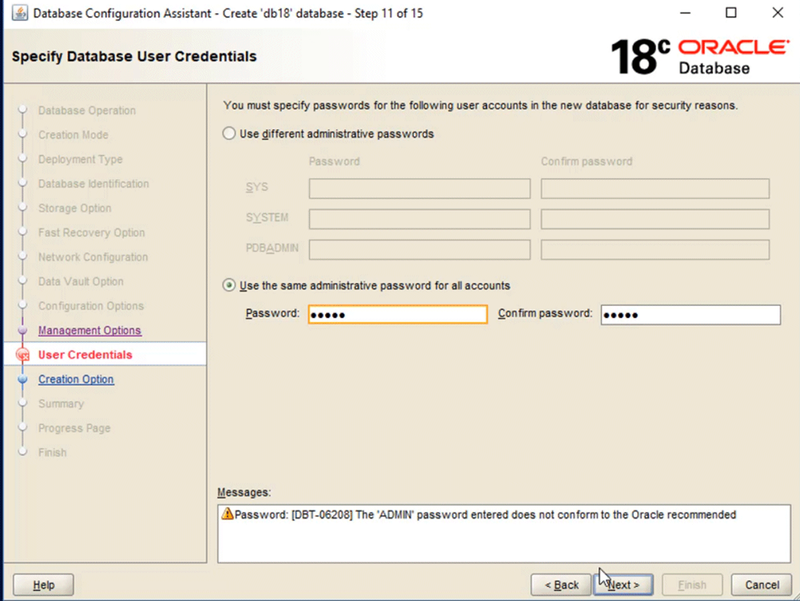 Now you choose how much of your server/desktop/laptop you’re going to allow this database to grab. My machine has plenty of RAM, but it also has a stack of other database versions running on it to handle my AskTOM daily tasks. So I’ll keep this dude at around 6G. Now we’ll flick across the other tabs on this screen to see if there anything of note. The default for processes seems to have gone up in this version (I think it used to be around 300 in 12c) but in any event, that’s more than enough for me on this machine. I have simple rule for character sets – UTF all the way. Single byte charactersets are soooo last century. We live in a global village, so you should be able to handle characters from all over the world! And for the last tab, I’m going to opt for the sample schemas, so that when my database is created I’m not just left with an empty database shell. I want some sample data there so I can jump straight in and start experimenting with this release. 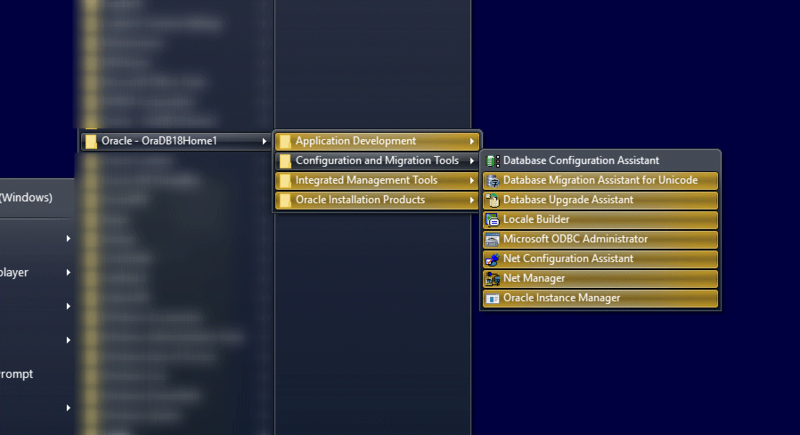 If I’m a DBA, I might go for some EM management to see how that all works, but for now, I’m skipping that. Being a sandbox for experimenting, I’m setting all the passwords to a common value. 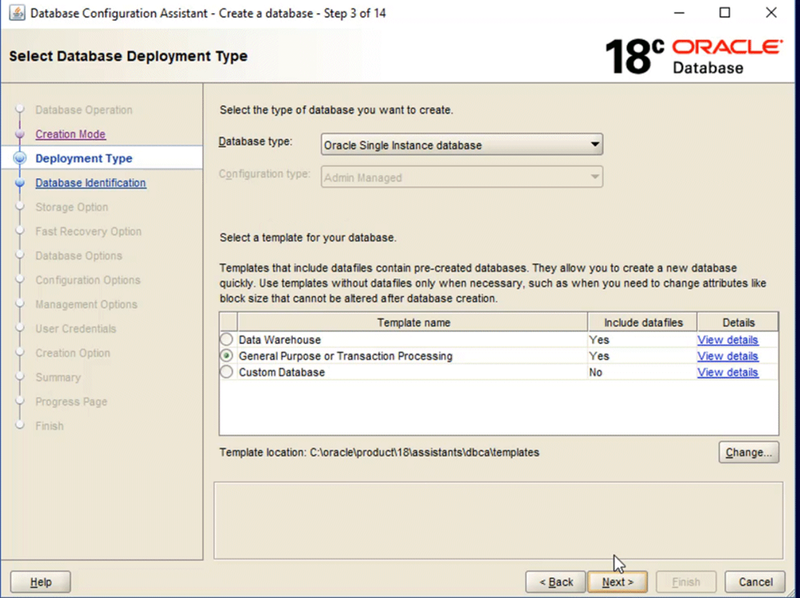 Naturally this will not what you’ll be doing for your production databases! So now I’m ready to go. I always tick the “Generate Scripts” option because it lets me see what is actually occurring when the creation assistant is doing its job. 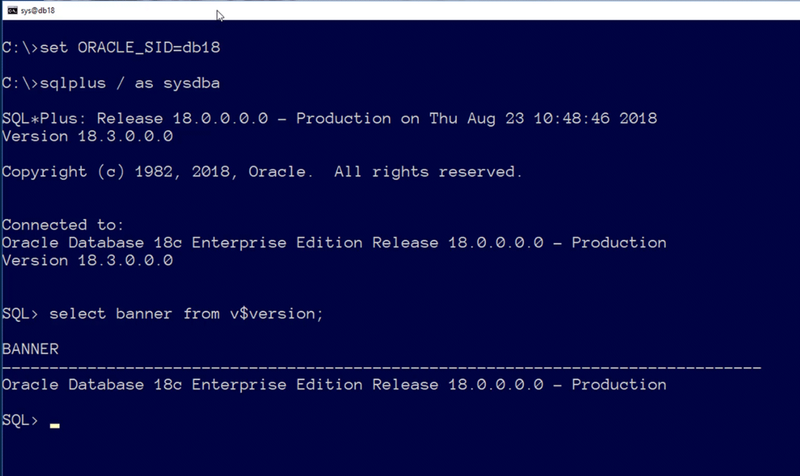 Even so, the scripts are probably not what I would use to automate a database install, since the ‘dbca’ command has nice command line option nowadays, along with the ‘-silent’ option so you can create an entire database with just a single command. I finally get a summary of what is about to occur, and we’re off! 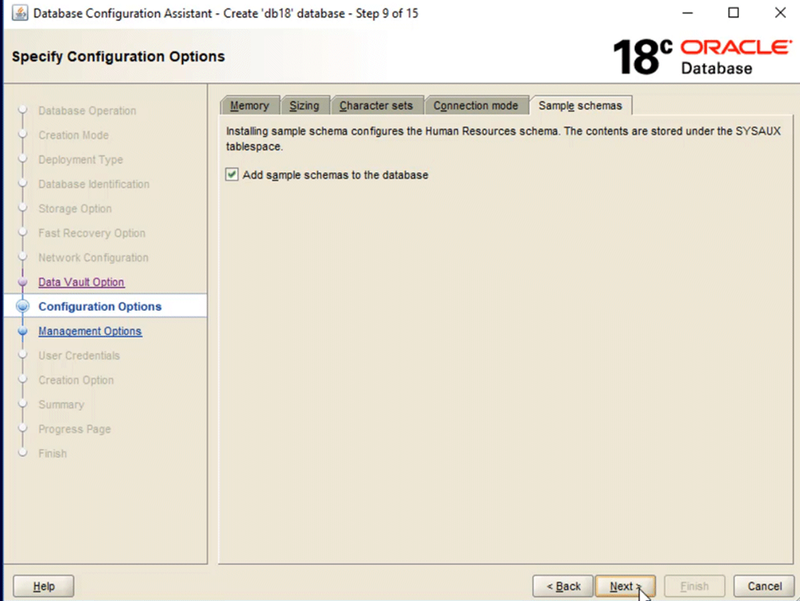 Database creation is go for launch! 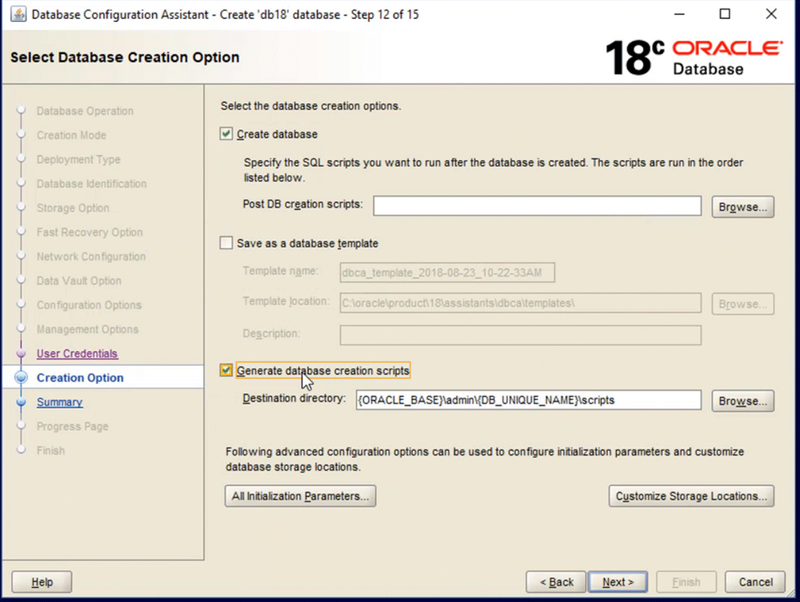 The total time to create your database will depending on your hardware, in particular how fast your storage is. I’ve done a few creations now using both flash storage and conventional hard drives, and unsurprisingly the flash storage is faster. You’re probably looking at around 10 minutes to complete. 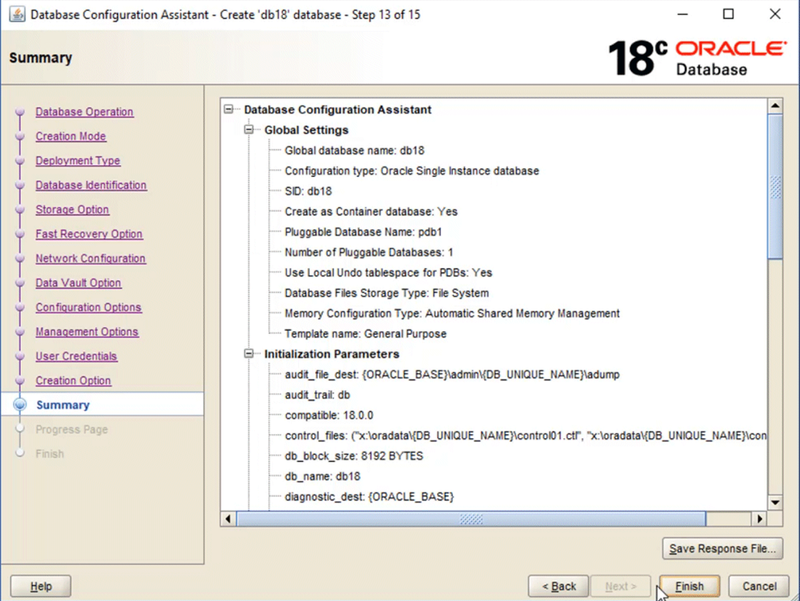 When your database creation is complete, you’ll get the standard summary screen and you are ready to go. 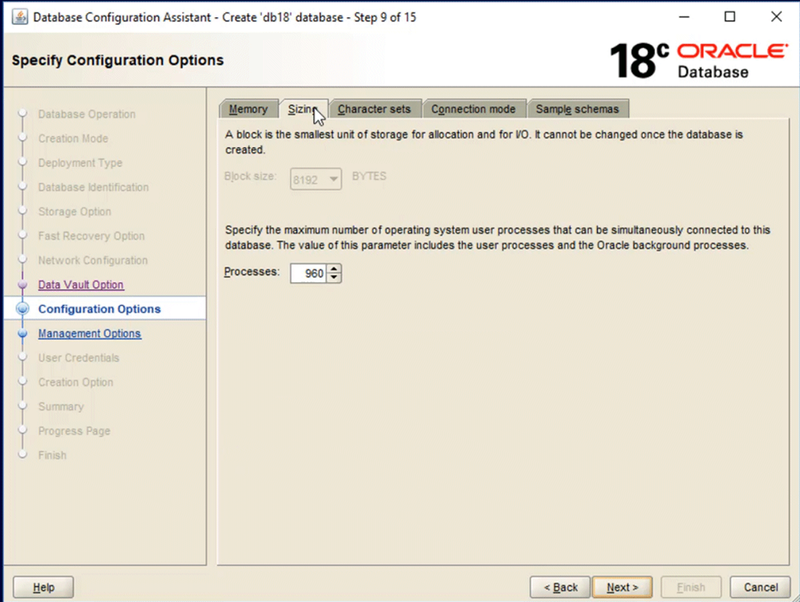 Enjoy your 18c Windows database !